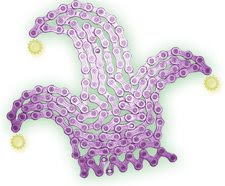 Skeese Greets: It's Mardi Gras! It's Mardi Gras, which is French for Fat Tuesday, the final day of the weeks-long Carnival season of feasting and celebration. It begins each year on January 6 and continues until Fat Tuesday, the date of which can fall between February 3 and March 9 depending on the Lunar calendar, used by the Catholic Church to determine the date of Easter. On Ash Wednesday (the day after Fat Tuesday) Christian revelers must sober up for the pre-Easter fasting and the penitential season of Lent. Although Carnival is celebrated in Christian countries worldwide, Mardi Gras in the US is most associated with New Orleans and began there in 1699. To celebrate, Krewes (organizations) hold balls and parades, wear masks and throw beads. The party ends at midnight on Fat Tuesday, the only time New Orleans closes.